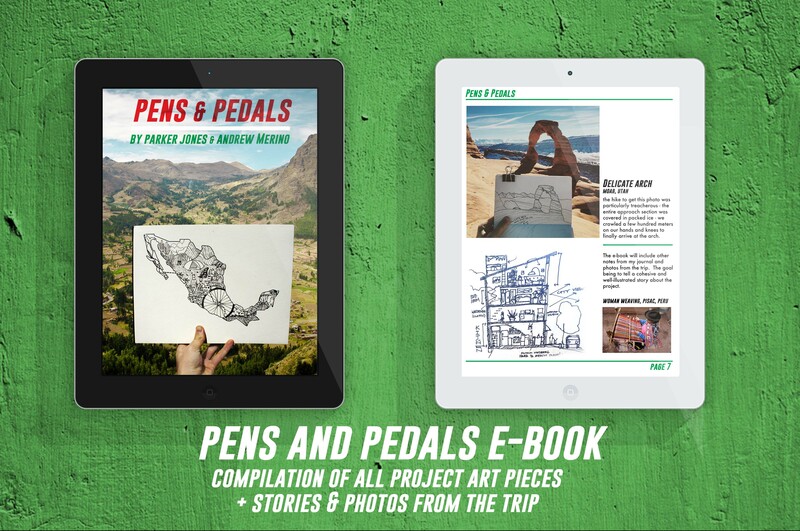 We'd like to draw beautiful, on-location sketches of the Mexican landscape while cycling 3000 miles south from the US border. 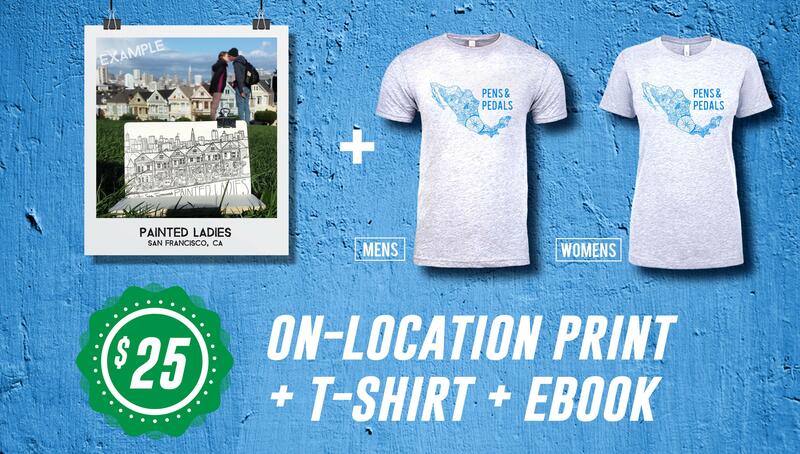 86 backers pledged $4,239 to help bring this project to life. The Gist: We'd like to draw beautiful, on-location sketches of the Mexican landscape while cycling 3000 miles south from the US border. It's a bike tour + art project. 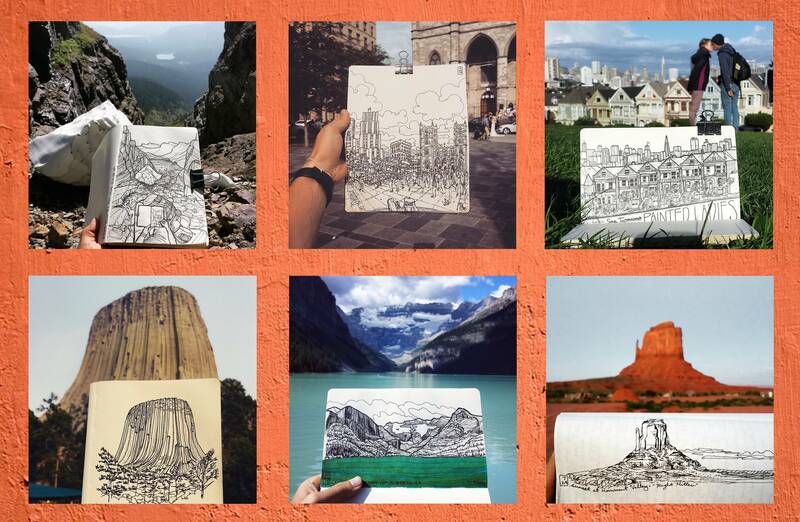 The Art: Over the past two years, Parker has drawn locations across the USA and abroad. These pieces are then photographed on location to permanently tie them to the place where they were created. See more of Parker's work on his website and on Instagram. Why you should fund us: If you choose to contribute, you not only help us on our way, you become a part of our story. The art piece that you'll receive when you become connected to this project will tell that story time and again. We want to create something unique combining cycling, art, and adventure--and we need your support to make it happen! About Andrew and Parker: We're both graduates from the University of Wisconsin, currently working and enjoying the mountain life in Park City, Utah. For the past two summers, we've worked as cross-country tour guides, taking groups of international travelers on camping trips across the USA. We've cultivated a long-standing love of bicycles and have significant travel experience in Latin America. For this trip, we're excited to polish our Spanish skills, get our legs into ridiculously good shape, and eat a downright silly amount of tacos. The expenses for this project will center around the production costs for the rewards: supplies (t-shirts, prints, frames, packaging) and time spent creating the pieces. We've then budgeted $300 for art supplies, as well as $900 for on-location expenses ($10/day x 90 days, split between the two of us). Maybe you've seen Kickstarter projects in the past that look more like a vacation than a meaningful collaboration. This is not one of those projects. We're about experiencing and capturing nature and the culture of Mexico - ultimately spreading a positive message about a country which doesn't always get the best press. By reaching out to a large audience through Kickstarter, we're hoping to spread that message through every drawing, print, and t-shirt we create. Logistics wise - black and white prints, along with the T-shirts will be made by a local Park City print shop, Motherlode Print & T-Shirt Shop. Color prints will be created through Mpix.com. Shipping will vary between USPS ($50 and under rewards) and Fedex ($120 & $300 rewards). If you have any questions regarding international shipping or PO boxes - feel free to reach out to us to coordinate. There are, of course, some significant risks involved in this project centered around the potential issues of cycling in Mexico. We're aware of the negative imagery many Americans associate with the country, as well as the legitimate problems that we may face. In order to ensure we're traveling as safely as possible, we've done hundreds of hours of preparation work - examining our routes, preparing our gear, and dialing in our Spanish language skills. We’ll be traveling low to the ground and doing our best to keep a low-key appearance as to not attract undue attention. With that said, a major injury or serious illness to either Andrew or Parker could cause us to return from Mexico earlier than intended. If this were to happen, we would work with backers to find an acceptable alternative (probably involving live sketching in the US rather than Mexico). However, so long as our legs pedal and hands keep sketching, we'll be able to fulfill the project. Many people, both US citizens and international travelers, have safely and happily completed cycling tours throughout Mexico - we fully expect to do the same. ORIGINAL on-location sketch with 8x8 print of photo. 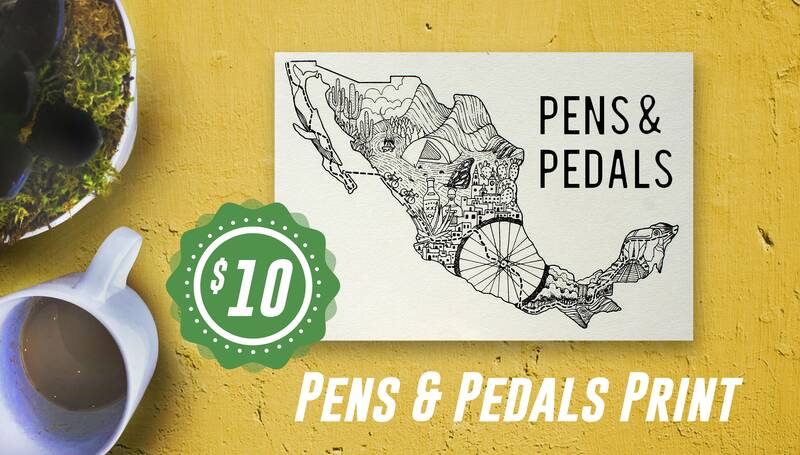 + High-quality, screen printed T-shirt of Pens & Pedals Mexico map. 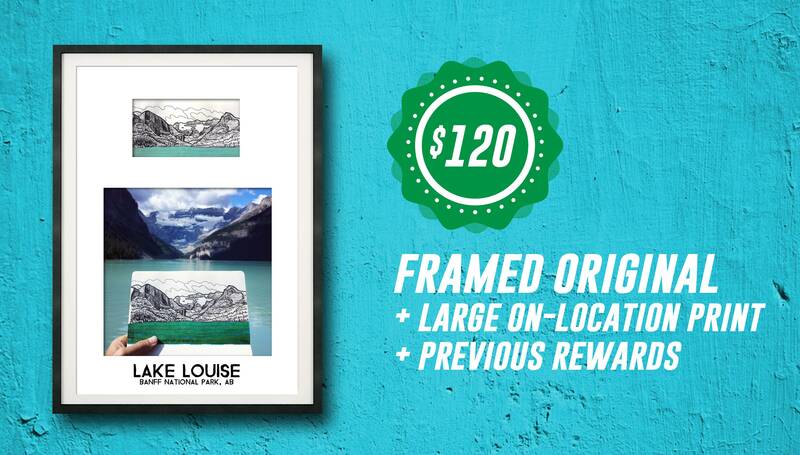 Framed 10x15 photo print alongside original sketch from a location / topic of your choosing! 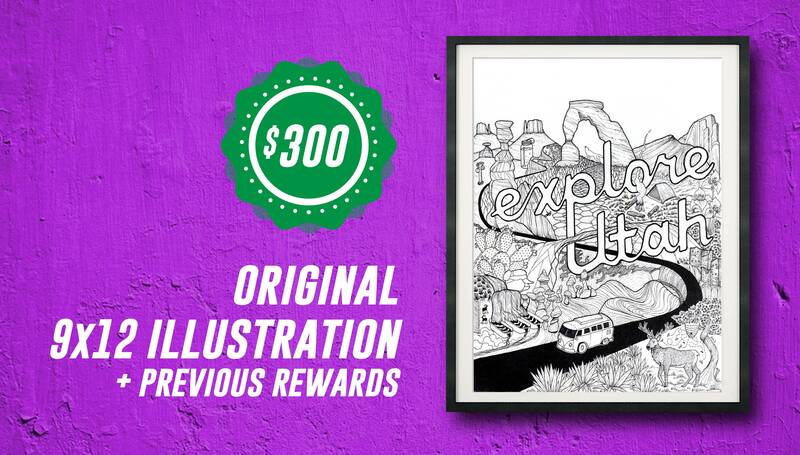 Full-detail, original 9x12 illustration (same quality as 'Explore Utah'). 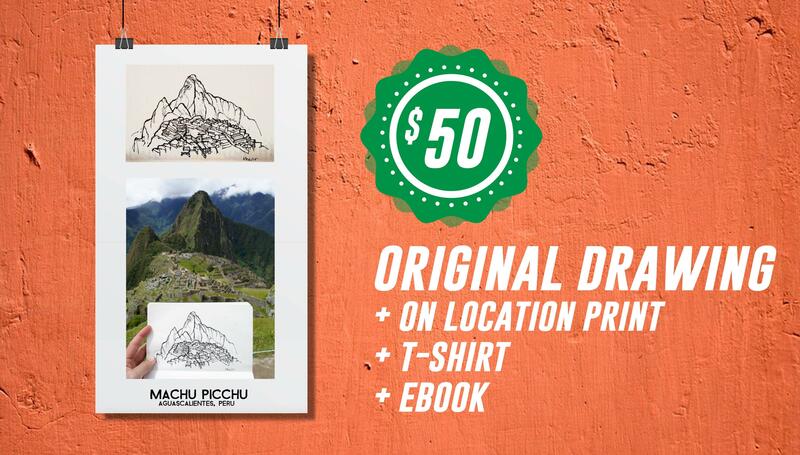 + Framed 10x15 photo print alongside original sketch from a location / topic of your choosing!